Edmond Hoyle, Gent. : A copyright fight in Dublin? A copyright fight in Dublin? updated August 30, 2013 with details about another copy of Wilson first issue identical to the Copisarow copy. In the past two essays, I have discussed the publication of Hoyle in Dublin—first the individual treatises and then the anthologies. The books were generally published by the Ewings, first George in 1743, then George and Alexander from 1743 to the 1760s , and lastly Thomas in the 1770s. When Thomas died, the Hoeys took over publication, first James from 1776 to 1783 and finally Peter in 1787. I have not commented on the intrusion of Peter Wilson in 1752 with his editions of Whist and Memory, and the collection The Polite Gamester. 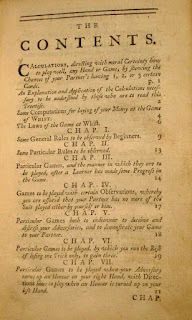 The Polite Gamester, containing short treatises of the games of whist, quadrille, back-gammon, piquet and chess, together with an artificial memory, or an easy method of assisting the memory of those that play at the game of whist. By Edmond Hoyle, Gent.--N. B. 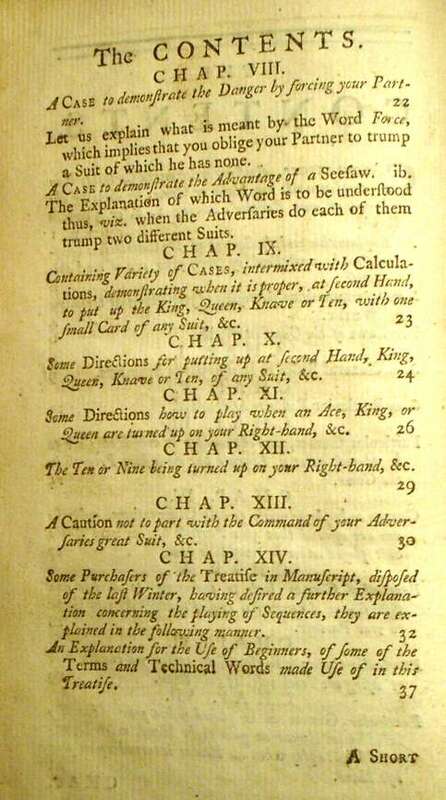 This thirteenth edition of the game of whist, with the above additions, not in any other edition printed in this kingdom, may be had separately, price 4d. *. * Be careful to ask for the edition printed for G. and A. Ewing. Two things strike me about this advertisement. First, it notes new material. Dublin was finally to get all the changes to the whist treatise that appeared in London after 1743 including the thirteen new cases of 1748. Second the advertisement suggests awareness of other versions that did not contain the new material. This Day is published, by Peter Wilson, opposite the old Horse-guard in Dames street, with two additional Chapters to the game of whist, (not in any former edition,) containing, a Dictionary of Whist, which resolves almost all the critical cases that may happen in the game, and 13 new cases now first published, (price a British shilling). Wilson was intruding on the customary rights of the Ewings. Indeed, he can said to be a pirate, even in the absence of a copyright law! What text was it that Wilson published? The title page, pictured at left, has several curious features. It is a word-for-word reprint of the Ewing edition of 1743, what I called Whist.D.3 in the essay on individual treatises. It is labelled a "fifth" edition, as was Whist.D.3, at a time when the Ewings were putting out a "thirteenth" edition. Hoyle's first name is given as "Edmund" rather than "Edmond," something which had been corrected in London in 1744. The table of contents, pictured below, are also identical with Whist.D.3 of 1743 and don't indicate the presence of any of the textual changes that had since been made in London in 1745 and 1748. Note the definitions of "force" and "see-saw" in the contents of chapter 8, something that dates back to the earliest London editions. Only 14 chapters are listed; there are 20 in the contemporary London and Ewing versions. 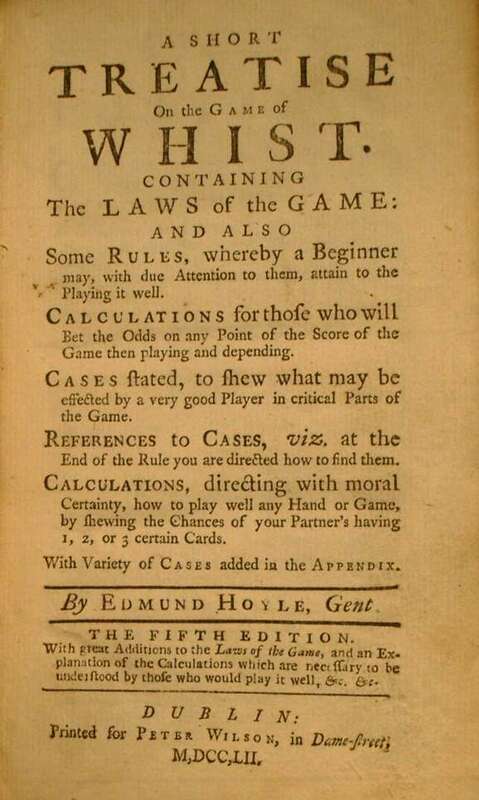 Finally, the laws of whist preceeding chapter 1 contain 25 laws, not 24 as in editions after the "third" London edition.It appears that Wilson was competing against the Ewings with a very old version of Hoyle's works. In the Copisarow copy, the whist treatise collates π1 A2 B-D6 E1 with six unnumbered pages (π1 A1.2) followed by pages 1-38. The text is identical to Whist.D.3. In all other surviving copies, there is an extra two-leaf, four page gathering after E1, with the page numbers continuing to 46. 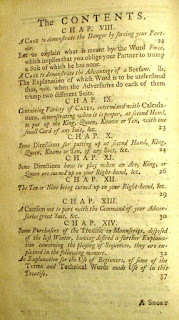 The extra pages contain the additional cases at whist from 1748 and other appearing in the Ewing edition and promised in the Wilson advertisement. Oddly, the first leaf of the new gathering is signed 'F2' and the second 'F3'. Since writing this essay, I have acquired a copy identical to the Copisarow copy. It seems clear that the four pages were added later to catch up to the Ewing Hoyle. 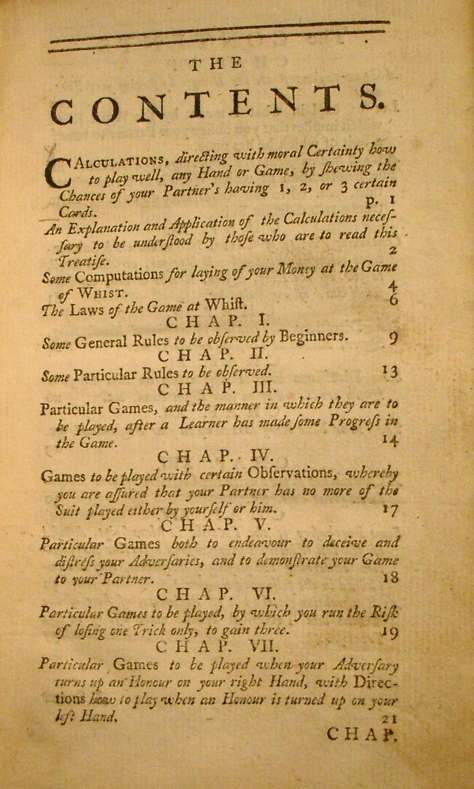 Wilson issued two versions of Whist as part of The Polite Gamester—the first an out-of-date reprint of an old edition and the second containing the updates from 1748. Wilson's entry into the Hoyle market was short-lived. 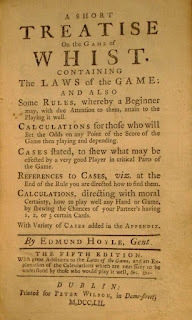 The 1752 whist treatise, and the Polite Gamester anthology were his only efforts, while the Ewings kept publish Hoyle for decades thereafter. I have consistently called the Ewing editions "reprints" rather than "piracies." It is fair, however, to call the Wilson edition a piracy. Mary Pollard, Dublin’s trade in books, 1550-1800. Clarendon Press ; Oxford University Press, Oxford; New York. 1989. Interesting stuff, David. Have you come across any evidence to suggest that the brevity of Wilson's publication of Hoyle might have resulted from a challenge from the Ewings over their 'ownership' of the copy? Difficult evidence to find, I suspect, but it would be nice to be able to demonstrate whether these 'piracies' were ever challenged. Good question, Justin. I assume that any challenge would have been made through the Guild of St. Luke, to which the booksellers would have belonged. I have not investigated what records of theirs have survived, but should certainly do so. Interestingly, Wilson also acted as a distributor for the London bookseller Thomas Osborne who owned the Hoyle copyright at the time. It would seem more natural for Wilson to sell the London Hoyles than to print his own. Thanks David. I find it curious that Wilson would agree to act distributor in Ireland for Osborne, since he could simply have reprinted the Hoyles himself without authorisation and kept all the profits. Perhaps that's what he did, and the initial agreement was an unscrupulous means of getting hold of the copy quickly? Just thinking aloud here! As I understand it, the Wilson-Osborne relationship related to Osborne's entire catalogue, not merely the Hoyles. Wilson clearly set the text for Whist from a 1743 edition, published before Osborne was involved, so Osborne wouldn't have been the source of the copy text. BTW, I wish the Dublin papers were digitized and available online--there are so many questions to be answered!